Working on abs or trying to lose weight or want to stay fit? Cut down 700 kcal straight and replace it with a meal of 142 kcal without spending time planning your diet. 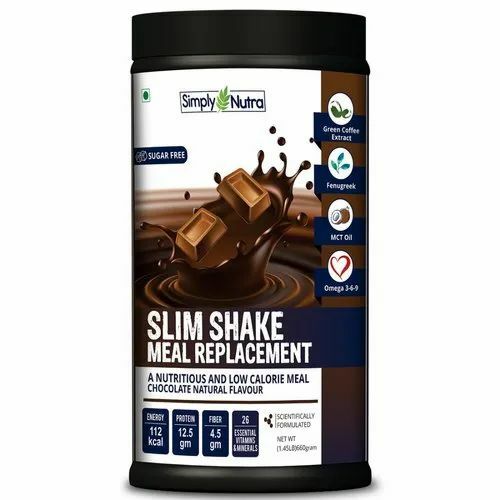 Simply Nutra Slim Shake brings you the easiest way to lose fat, go slim! It has the most effective ingredients that will help you lose weight like Green Coffee and Fenugreek Extract, MCT Oil, Taurine, Omega 3-6-9, Protein and 26 Essential Vitamins and Minerals. Try two of our delicious flavours:Strawberry and Belgian Chocolate. Enjoy it even when you are traveling. It is convenience in one bottle. Packaging Details It has the most effective ingredients that will help you lose weight like Green Coffee and Fenugreek Extract/ MCT Oil/ Taurine/ Omega 3-6-9/ Protein and 26 Essential Vitamins and Minerals. Soulager Healthcare Private Limited is engaged in manufacturing an exclusively fabricated assortment of Weight Loss, Fitness Supplements, Sexual Wellness, Dietary Supplement. Designed and fabricated in line with the industry defined principles and quality guidelines, the fabrics used in their development are of top notch quality and are acquired from trusted sellers of the industry.